Included are 3 stainless steel instruments. 1 Littauer scissor, 1 adson forcep, and 1 Iris scissor. 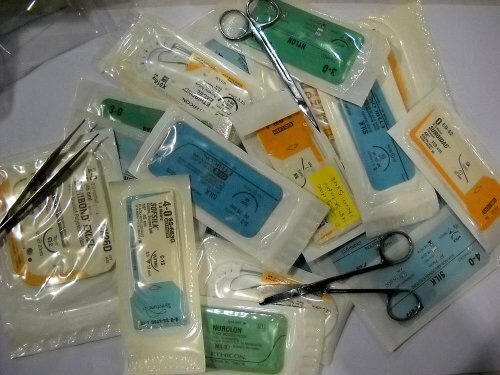 For teaching and research, contains a variety of non-absorbable sutures Available in a variety of sizes and needles. Out dated but in original sterile packaging. Absolutely no choice of material, size or needle. Comes with 3 stainless steel instruments. NO RETURNS ACCEPTED ON THIS PRODUCT TEACHING, RESEARCH, VET USE ONLY.